Back for a third year, Read Bread Maker Week celebrates everything from breadmakers to high street bakers. It’s a perfect excuse to dust off your breadmaker and bake a real loaf. This week the Real Bread Campaign is encouraging people to ‘give a little loaf love’ to real bread makers – and it doesn’t matter whether that’s a breadmaker, your hands or high street bakeries. If you don’t fancy getting doughy hands, you can choose the best breadmaker for you from over 20 full tested models in the Which? breadmaker reviews. The smell of home-baked bread is enough to make anyone hungry, but how can you tell whether a breadmaker will bake a decent loaf? To judge a breadmaker’s quality, our lab experts bake white and wholemeal loaves on the basic and delay-setting programs. We also bake with easy-to-use bread mixes. Our experts scrutinise every loaf made by the breadmakers we test – rating the homemade loaves for appearance, texture and smell. Which? 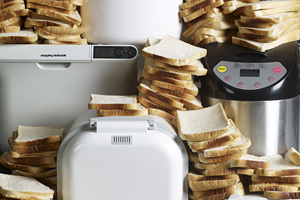 breadmakers expert Lisa Galliers says: ‘Real Bread Maker Week is the perfect excuse to dust off your breadmaker and fall back in love with it, or take the plunge for the first time and try making your own bread. It’s really easy to get started, and a decent breadmaker can be a really useful addition to your kitchen. The Real Bread Campaign is encouraging people to arrange open days, bread making workshops, discounts, bread machine exchanges and other activities to encourage the nation to buy or bake more local loaves of bread. You can find and add details of events and offers at Realbreadcampaign.org.